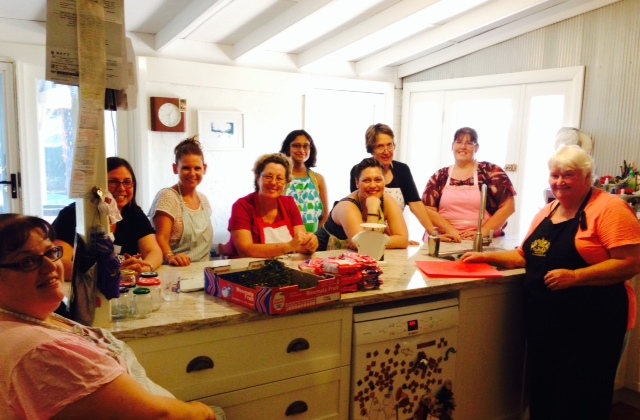 The first Kitchen Gardeners’ workshop, Jam in January was a huge success with a happy lot of ‘Gardeners’ leaving with one (or three) jars of delectable jam. 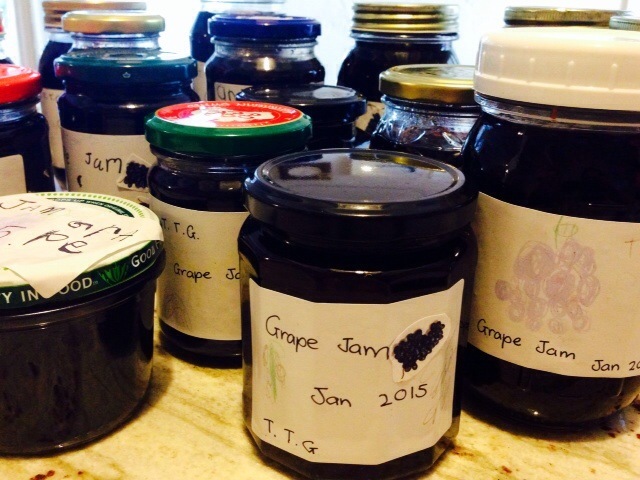 Bev Roseveare generously shared her recipe for black grape jam, perfect for the short grape season and a delicious accompaniment to toast or ice-cream! We learned that berries including grapes don’t have much natural pectin – the ingredient in jam that helps thicken the liquid. This means berry jam is often more sauce-like. 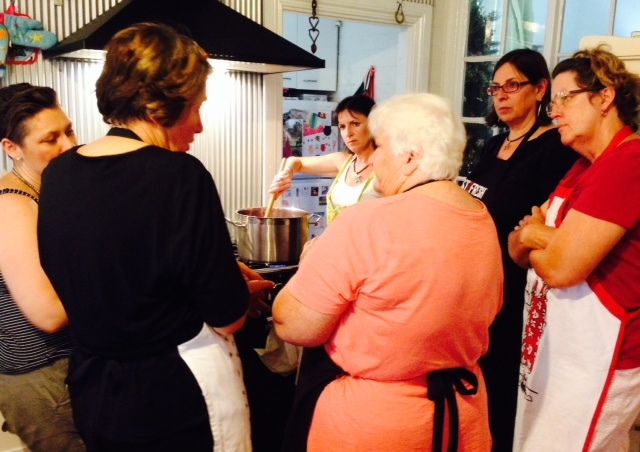 We used jam setting sugar that includes pectin, but we also added a lemon to the pot to help the setting. Meanwhile, Felicity ran the Kitchen Kids’ Club, its new members making the very beautiful labels for the jam that you will notice in the first photo. 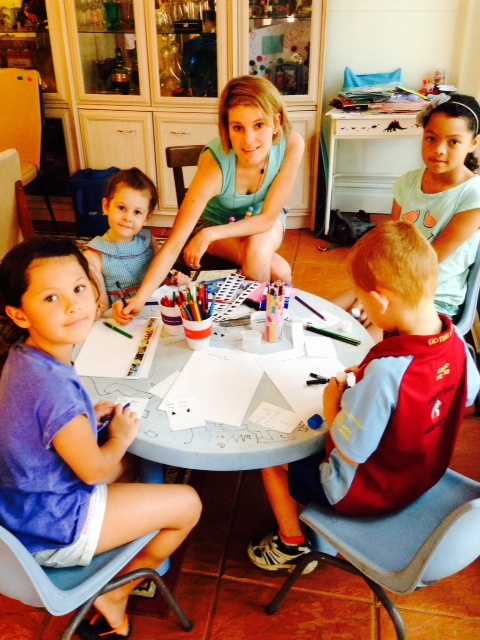 Thanks Felicity and the children for your creativity. And we all shared tips, stories, a few laughs and even a glass of wine while taking turns stirring the pot. Thanks to everyone who made it along and helped with our message of sustainable living and eating in season! – 4 or 5 kilos of seedless black grapes. 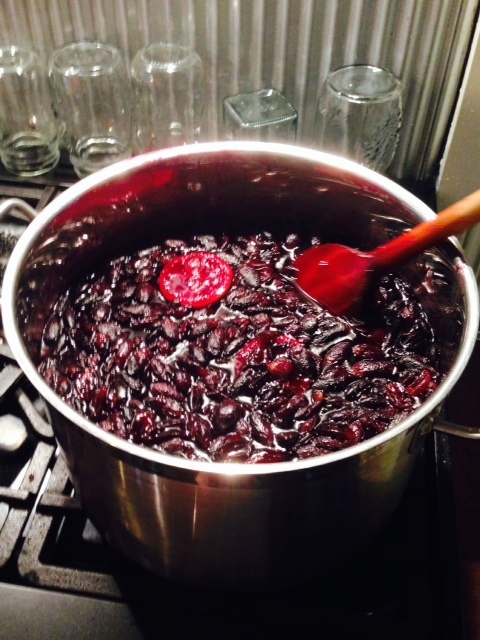 – 4 or 5 kilos of jam setting sugar, or caster sugar plus powdered pectin. – 1 or 2 lemons, cut in half. – Cut all fruit and weigh it before putting it in a large pot. A little water can be added to the bottom. -Bring the fruit to the boil. Mash up the fruit. – Once the pot has come to the boil, add the sugar one kilo at a time and stir constantly to keep it from burning. – Bring the pot to the boil, then add the next kilo. Repeat until all the sugar is in the pot. – Boil and stir on a fast heat for about one hour, or until the liquid has reduced by about half. – For the ‘jam test’, put a teaspoon of jam on a cool saucer. Wait until the jam has cooled and run a teaspoon through the jam. If a skin forms, it is ready to jar. – Jar in cleaned and sterilised recycled jars. Join us on Facebook! Share with us on the Transition Town Guildford – Kitchen Gardeners’ Group. This entry was posted in Food, Gardening, Kitchen Gardeners, Sustainable Home and tagged DIY gardening, in season fruit, jam, Jam recipe, kitchen, Kitchen Gardeners, preserves, preserving. Bookmark the permalink.